The K31, arguably the finest infantry bolt-action rifle ever made, meets the 21st century design and technology. Welcome to the home of the most advanced K31-based shooting platform to date. 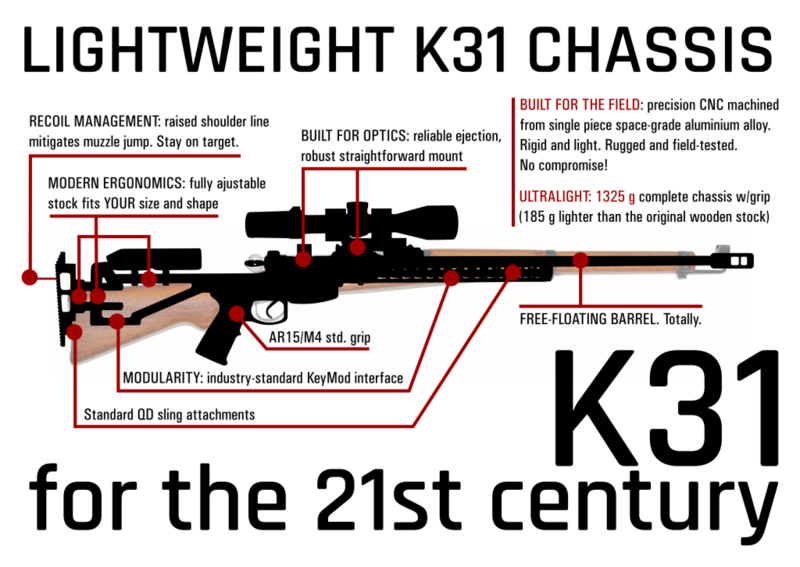 All that you ever wanted to know about the Ultimate K31 Chassis (as well as many things you probably did not want to know) in presented under “The Chassis” section. Furthermore, the “Documents” section contains, well… documents and all kinds of information on our favourite rifle, from its beginnings to the present day. Finally, our Webshop has everything one would ever need to give the Karabiner 31 all the credit it is due in the 3rd millennium. We proudly support proTELL! Become a member today! More information: politics page (French language only). Unless explicitly stated otherwise, the contents of this site are made available under the WTFPL license.